Smoke rises after airstrikes by military jets in Talbiseh, a city in western Syria’s Homs province, where Russia launched airstrikes for the first time, Sept. 30, 2015. The image was made from video provided by Homs Media Center and authenticated by AP. U.S. Secretary of Defense Ash Carter says Russian airstrikes in Syria hit areas that “probably” did not contain Islamic State. "It does appear [the strikes] were in areas where there were probably not ISIL forces," Carter said, referring to an alternative acronym for the IS group. In a Wednesday afternoon news conference, Carter reiterated that the United States will continue to lead coalition airstrikes against Islamic State targets in Syria, ignoring Russia's request for U.S. aircraft to avoid that airspace. U.S. Secretary of State John Kerry said that the U.S. and Russian militaries will hold talks as soon as possible, maybe Thursday, to avoid encountering each other in Syria. After a meeting with Russian Foreign Minister Segei Lavrov at the U.N., Kerry said,“ "We agreed on the imperative of, as soon as possible -- perhaps even as soon as tomorrow, but as soon as possible -- having a military-to-military deconfliction discussion," Kerry told reporters with Lavrov at his side. Russia began bombing attacks early Wednesday in support of the Syrian government in the Homs region of Syria. Earlier, Kerry said the U.S. would have “grave concerns” about Russian airstrikes in parts of Syria where Islamic State or al-Qaida-affiliated militants are not operating. He spoke Wednesday at a Russian-hosted U.N. counterterrorism forum. “Strikes of those kind would question if Russia’s real intentions are fighting ISIL or protecting the Assad regime,” said Kerry. Russia’s decision to begin airstrikes in Syria in support of President Bashar al-Assad’s regime "is tantamount to pouring gasoline on the fire" of that country’s four-year civil war, said Carter. Russia's heightened involvement in Syria "only risks escalating the civil war," he added. At a meeting with Kerry at the U.N. Wednesday, Russian Foreign Minister Sergei Lavrov told reporters, "Don't listen to the Pentagon about the Russian strikes." Secretary Carter on Tuesday directed the Pentagon staff to communicate with Russia about coalition activity in Syria, to avoid any mistaken encounter between coalition and Russian forces, a Pentagon spokesman said. But U.S. State Department spokesman John Kirby said a Russian general in Baghdad gave U.S. embassy personnel scant notice early in the morning of the planned strikes in Syria. An unidentified Pentagon source told VOA that U.S. pilots were not in danger, because they were flying in other airspace, over Islamic State hotbeds. The coalition struck at Aleppo on Wednesday. The source said the extremist group is concentrated in the northern cities of Ruqqa and Aleppo and the eastern city of Deir al-Zour. In contrast, many fighters and other opponents of Assad's regime are in Homs. A Syrian activist also told VOA of suspicious activity. Russia has begun bombing near the western Syrian city of Homs, U.S. defense officials say. "Today, Russian planes conducted a series of airstrikes around the suburbs of Homs city," Bassam Barabandi, a former Syrian diplomat and co-founder of the Syrian activist group People Demand Change, wrote in an email. "They targeted only opposition-held areas of Homs and Hama provinces." “The only way to fight international terrorism – and it is gangs of international terrorists that are fighting in Syria and in neighboring countries – is to act preventatively, to fight and destroy militants and terrorists on the territories that they already occupied, not wait for them to come to our house,” said Putin. Russia has been building up its forces in Syria, with bombers, jets and troops arriving in the country's northwest in recent weeks, Pentagon officials said. France, too, this week began bombing Islamic State targets in Syria. But it firmly supports replacing Assad, whose regime has been accused of dropping barrel bombs and using poison gas on its own people. "It is our responsibility to act against the impunity of these assassins, Fabius said in a statement. 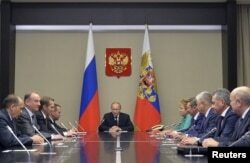 Russian President Vladimir Putin, center, meets with Security Council members at the Novo-Ogaryovo state residence outside Moscow, Sept. 30, 2015. On Monday, Putin and U.S. President Barack Obama met in New York, during the United Nations General Assembly, in part to discuss the situation in Syria. VOA contributor Charles Maine, Pentagon correspondent Carla Babb and State Department correspondent Pam Dockins contributed to this report.